A healthy mind can lead us to a healthy body – and a much happier life. Fitness First started motivating many since 1993 when first club opened in Bournemouth in the south of England. Today, they are one of the reigning names in the fitness industry worldwide. In Singapore alone, Fitness First has over 17 clubs island wide practicing their company’s belief which is to offer the best equipment, range of classes, knowledgeable staff and personal advice in a welcoming environment that feeds their members’ motivation. Fitness First had their Lunch Demo series for the second time last Friday. This time, it was held at our bustling JustCo 120 Robinson Road. What a way to end the week or should I say start the weekend! 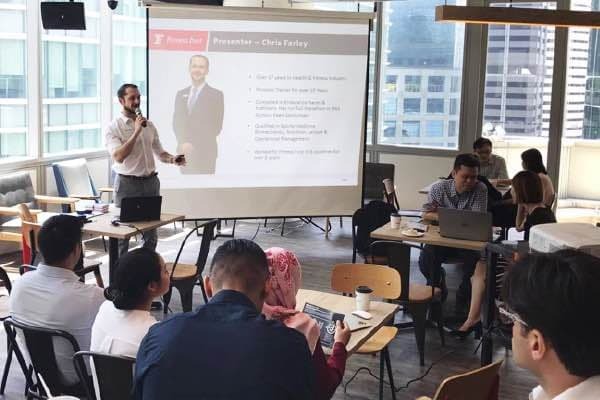 Chris Farley, Club General Manager at Fitness First Capital Tower Sport Performance Club, shared about the benefits of exercise. Chris has over 17 years work experience in Health and Fitness Industry. He is qualified in Sports Medicine, Biomechanics, Nutrition, Leisure and Operational Management. Posture was one of the topics that were touched on. Who knew that a little slouching could do so much damage? Posture not only increase risk of death and disease, it actually contributes a lot to creating more stress and also affects on how people sees us. Chris shared with us how exercise can help combat lower back and neck pains, which are caused by a sedentary lifestyle. Easy to follow exercises that encompasses the 5 key elements of fitness which we can regularly practice at home and even right at our own workspace. Not only the attendees had the chance to get a free body composition analysis, they brought back a limited edition golf ball as a souvenir from the Lunch Demo session. All of us walked out of the session with different knowledge of exercise. Some were seen chatting with Chris, probably signing up for their membership considering that JustCo members are entitled to a corporate rate. It is never too late to get back to those New Year resolutions of ours. Happy Exercising!